The following is a found advertisement published in Architectural Forum published some time between January and June 1948 (specific date and page at this juncture unknown). The graphic design is attributed to Serge Chermayeff and a set of four designs are in his archive at the Avery Library at Columbia University. At this juncture, very little is known about the designs. Above you’ll see an embedded interior concept illustration attributed to Morris Lapidus. A contact at his archive at Syracuse University was unaware of any work related to the Miller Company, a manufacturer of commercial lighting. With the 1948 dating, it is assumed that the graphics commissioned and magazine placement were organized by the Miller Company art / design director Emily Hall Tremaine and CEO Burton Tremaine. 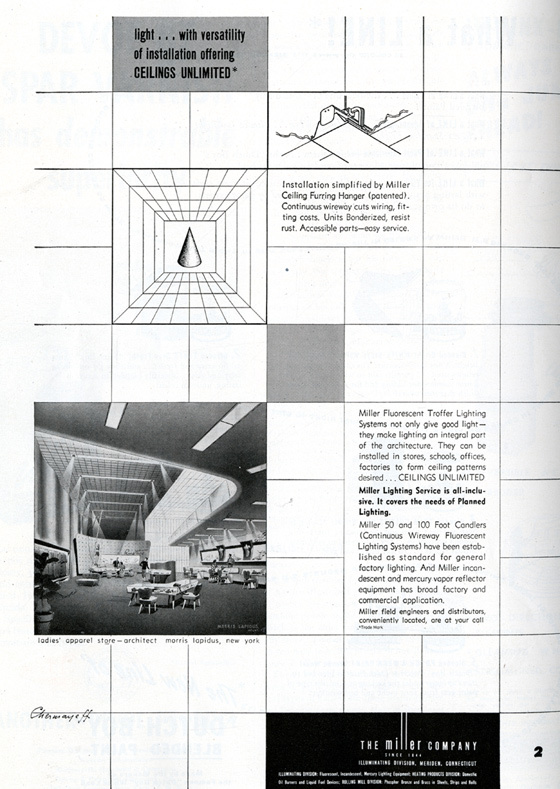 Again, at this early juncture, it is believed that there may have been a 1948 Ceilings Unlimited trade catalogue which may have published these designs and possibly others, while also utilizing them in print advertisements. The number "2" perhaps suggests a design catalogue was published, among 3 other similar graphics attributed to Chermayeff also with page numbers. On these other "pages", interior concepts are attributed to designers Allen and Edwin Kramer (classroom, New York), Jose A. Fernandez (camera store, New York), and Serge Chermayeff (jewelry store, Chicago). However, a surviving copy of a 1948 trade catalogue has not yet been located. There was however a 1945 Ceilings Unlimited trade catalogue that has survived, with a very different design. Miller Company. (February 1948). Advertisement: "Miller troffer lighting gives you good light plus ceilings unlimited..." [Graphic illustration presumably by Serge Chermayeff. Commercial interior installation attributed to Serge Chermayeff.] Nation’s Business, (approx.) p. 9. (2016-). Miller Company design catalogues and historical information. artdesigncafe.com. Preece, R. J. (30 December 2017). Painting toward architecture (1947-52) in 2017: Three works, three histories, three Modern mysteries. artdesigncafe.com.